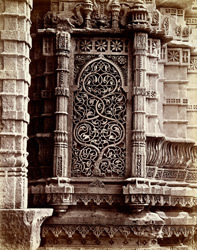 Photograph of the base of the minaret of the Nagina Masjid at Champaner in Gujarat, taken by Henry Cousens in the 1880s for the Archaeological Survey of India. The ruined city of Champaner is situated north-east of Ahmadabad. It was a stronghold of Rajput kings until the Sultanate ruler Mahmud Begarha (r.1458-1511) took the city in 1484. Mahmud founded a new city at Champaner and moved his capital there. The Nagina Masjid, or Jewel Mosque, dates to the mid-16th century and is situated just north of the citadel. It has a similar plan but on a smaller scale to the Jami Masjid in the same city (1523), which was in turn modelled on the Jami Masjid at Ahmadabad (c.1424). This is a view of a carved stone niche at the base of one of the minarets.